I can't leave that filthy alpaca alone. I've been spending hours combing it by hand into little cloud-like coils. In fact yesterday I went to an all-day spin-in. I spent six hours spinning it. 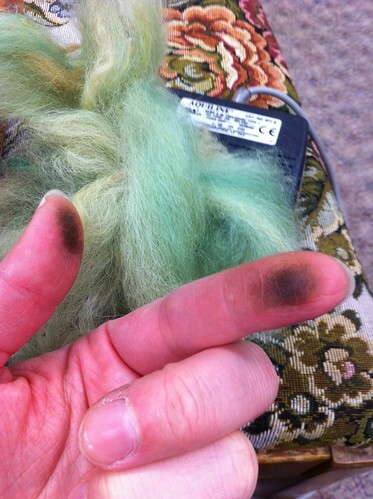 Even after washing (multiple times), carding and combing, this is what it did to my hands. Say it with me, "Ewwwwww." It's gross, right? But I keep going back to it. 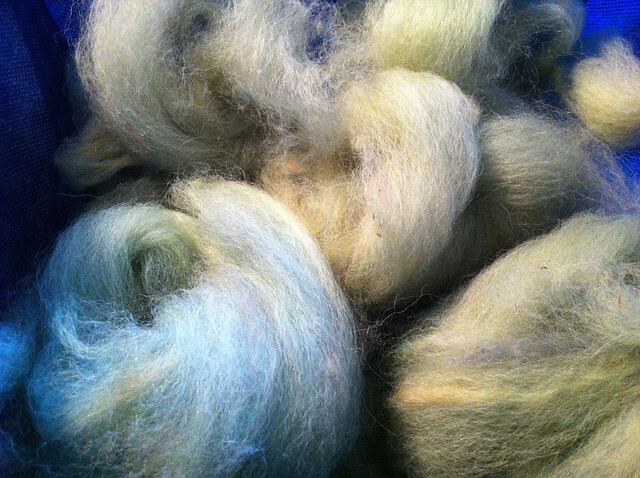 Yesterday I carded the rest on my drum carder and still only got about half of it combed. You may be wondering why I'm carding and combing this beast. The locks are really clumped up with dirt. When I just comb it it takes a huge amount of time and energy and I end up throwing away a lot of fiber. 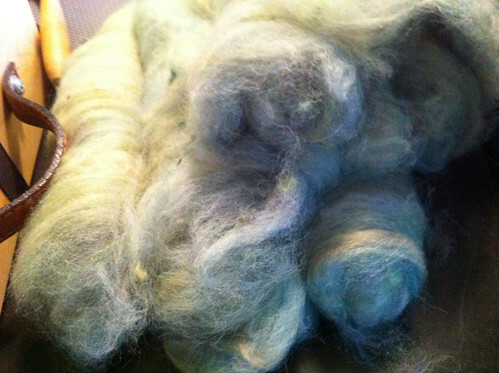 Carding it first kind of breaks it up and makes the combing much easier and more productive. I can't just card it either because of the amount of veg in it. If I just carded it all the hay and grass would just get mushed up and mixed in with the fiber. I want to get as much out as possible. I'm going to try to take a little break from it tonight. But it keeps pulling me back in! I don't spin but I could imagine not being able to leave it alone either. Pretty colors. That is one filthy beast. Are you sure this alpaca wasn't a smoker? That sure looks like tar. When I get a mess like this, I use a flick carder to get out the junk and dirt, then card. Works pretty well for me. Just bought a little ranch, wanted alpacas for the wool. Note to self: wash animal before shearing! Gotta be easier than what you're trying to do!